The apiary entrance is getting really pretty now as the wild flowers shoot up. White dead nettle, green alkanet and bluebells decorate the floor. Buzzing can be heard as bees on a mission zoom past your ears. Today was overcast with a breeze that proved chilly at times. Coats were needed at the apiary, so inspections were quick. When I arrived Tom and Jonesie had arrived already and were busy inspecting. Tom is worried about the hive above, which has no brood and so is probably queenless. Being queenless usually makes colonies aggressive, but these bees were moving sluggishly and didn’t seem bothered by the inspection. Tom is going to test them for nosema, in case this is causing their slow-moving behaviour. 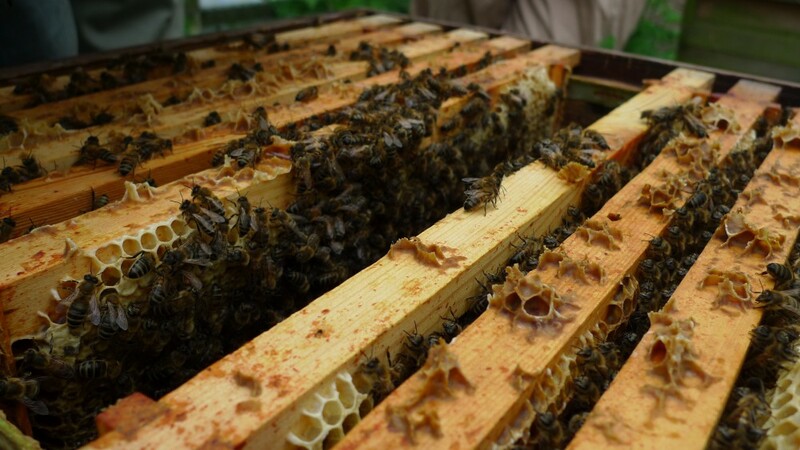 He took a frame of brood from Jonesie’s hive to see if they try and make a queen cell from it. Above Tom is inspecting Ken’s hive. In the middle is Freddie, on the right Jonesie. Unusually they all look really serious and solemn, this isn’t usually the case! These bees are much darker and also seem healthier, with plenty of brood and stores. Sometimes I like looking at these photos of multiple bees afterwards and taking in what they’re all up to. It’s sweet seeing their little heads peeping up from the top of the frames. Some on the fifth frame from the left have found a patch of dark honey to feed on, left behind after Tom scraped some rogue comb away. Some of the beginner beekeepers helped Emma and I inspect our hives. Myrtle’s and Chili’s colonies both have capped brood two weeks after the shook-swarm. Chili’s are definitely busier and have managed to draw out more comb. Emma has been great at going to the apiary mid-week and topping up their sugar syrup. We would really like to get Chamomile’s colony onto fresh comb now we know they have nosema, but are waiting for a nice sunny day to do that. Today I noticed a few uncapped larvae in the middle of a patch of capped brood in her hive. They worried me as they were in an upright position, not coiled and segmented as uncapped larvae should be. I used tweezers to take one out and it was quite watery, definitely not right. We popped it in the smoker to burn it. Tom thought perhaps sacbrood could cause this. Looking back at my photos of sacbrood from this 2012 National Bee Unit workshop – Honeybee viruses – I think this could well be the case. The notes I took on the day say “Not a serious disease, as many hives have little patches of it. 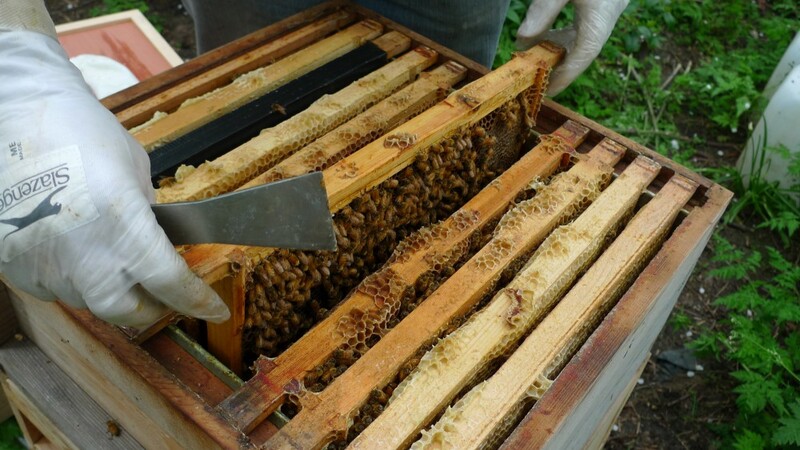 If it becomes a larger problem, it’s best to requeen or shake the colony onto clean comb.” Our battle to keep our bees healthy and happy continues! This entry was posted in Disease prevention. Bookmark the permalink. What a great post again. Glad to see your bees doing well. “Like European foulbrood, sacbrood is most commonly found in the spring. No chemotherapeutic agent is effective against sacbrood. Requeening may be helpful, but most colonies appear to recover spontaneously from the disease.” I bet you’ll be fine. That Michael Bush quote fits with what I’ve read about it too. I suspect it happens in the spring because that is the time when brood outnumbers adult bees, and the adults are stretched trying to look after their charges. Probably that means the brood is not receiving the optimum nutrition and warmth. Most definitely! And makes for some amusing photos afterwards. 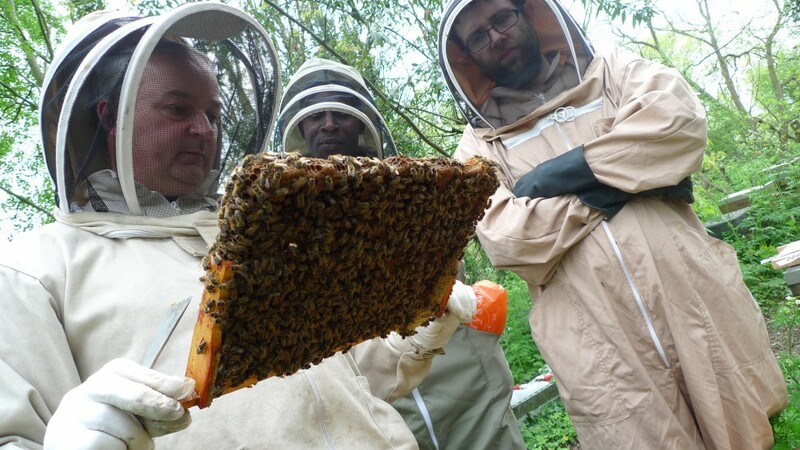 A lovely reflection of last weekend – it was rather a relaxed crowd of beginners, I think the bees liked them! No stings is always a good sign! How do you test for Nosema?